We’ve spent more than a decade manning the Army National Guard’s phones—and now the Navy. Here’s (some of) what we learned. Keith Kawasaki, our government-services superguru, calls it the “front-door experience.” It’s the feeling customers get when they walk in your front door, and it’s made up of a million different things. Muck it up, and customers take their business elsewhere. But get it exactly right, and your customers aren’t just going to come back—they’re going to bring their friends. In fact, you can blow minds. Did I wish they spelled my name right? Yes. Was I still floored by the thoughtfulness? YES. My wife once called a call center to buy a pair of shoes for our wedding and ended up talking to the sales rep for over a half-hour. (The conversation was only marginally shoe-related.) 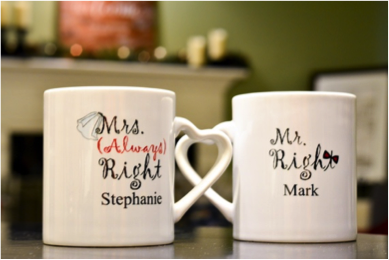 A few weeks later, a package showed up at our door with two customized coffee mugs, complete with our names, and a handmade card congratulating us on our wedding. My wife told everyone. This kind of customer service raises the bar for what a call center should be. And the reality is that for many businesses, the customer service your call center provides is the only front-door experience you’re going to get. You don’t have to give out coffee mugs to every caller, but the right investments in strategy and people go a long way in creating an extraordinary customer-service experience. Here are a few secrets. Imagine you are one of your customers, and you’re ready to buy a product. Imagine getting in your car, driving to the store’s brick and mortar location, and being greeted by a locked door with a “We’ve moved” sign. How would you feel? Well, those calling into your call center get that exact feeling—frustration—when they have to call back … or get transferred … or discover the call center can’t provide the resolution they need. So, whether you’re selling shoes or putting soldiers in boots, conversion rates rely on one-touch customer service. Provide it by delivering actionable data and resolving conflict when the caller needs it—which is now. If you’re stocking your cubicles with rookies, your customers probably aren’t getting the information they need. That’s why we built a workforce for our Navy call center composed almost entirely of prior-service military personnel, because nobody knows the ins and outs of service better than former service members. This allows our operators to answer an almost endless variety of questions about what life is like in the Navy. Like how it feels to pull on that white uniform. We want to know! Your customer-service reps talk to clients and customers every single day. If you’re not mining that data for business and brand insights, you’re missing a huge opportunity. Intensive audience research + audience involvement = audience empowerment. We regularly update NationalGuard.com based on call center feedback. For example, we recently started receiving hundreds of calls regarding hurricane relief efforts. So, our National Guard call center recommended we include actionable relief info for NationalGuard.com's website when hurricanes are active, creating a direct connection between what our visitors want and what they get. Our call center number, 1-800-Go-Guard, is the Army National Guard’s “front desk.” We have callers who are legislators, concerned moms and teens ready to enlist. Our operators are brand ambassadors to all. The reason is our extensive QA program. Because it’s not enough to provide annual feedback, our operators aren’t just monitored regularly; instead, they get regular feedback on their calls, which enable them to make qualitative course corrections quickly. Truth be told, we have even more secrets. And while we can’t give them all away, you’re in luck: We’re always looking for new call center clients to provide world-class customer service for. How may we be of service?